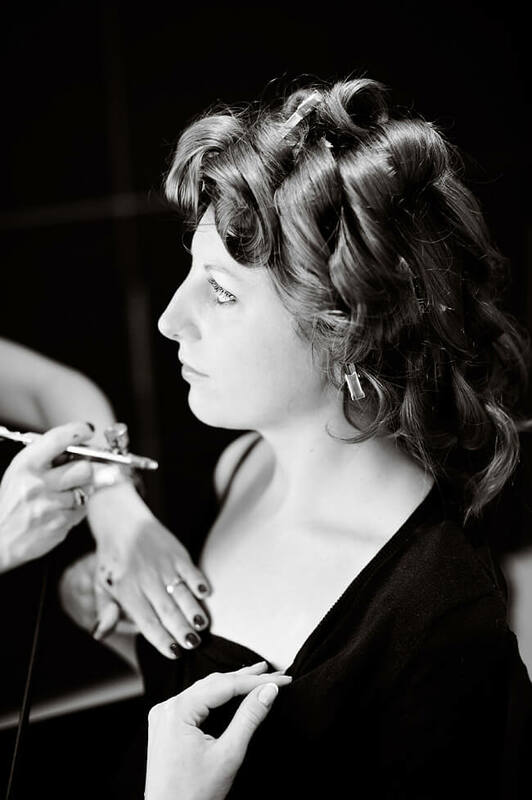 Clare is a skilled airbrush make-up artist and offers the service to her bridal clients. Airbrush make-up is make-up sprayed onto the skin using an airbrush instead of being applied with sponges, brushes, fingers, or other methods. It is popular in film, TV, theatre and now favoured by many brides. It is as natural with unbelievable coverage. It is sprayed onto the top of the skin and fills in any flaws, instead of accentuating them. Airbrush foundation offers clients medium to full coverage but fine in texture which is dispersed as sheerly and evenly as possible. The result is perfect-looking skin achieved with a minimum of amount of product, never cakey nor heavy – just a flawless natural finish, skin you were born with! It is extremely lightweight on the skin with many clients commenting “I do not feel like I am wearing any foundation at all”. Feeling beautiful and luxurious on the skin, it does not clog your pores, allowing your skin to breathe. This is favourable if you do not like wearing heavy make-up and also during hot summer’s days. It is also very long wearing and photographs beautiful due to it’s High Definition properties. Long- wearing – will stand up against heat, tears, oil, hugs and kisses! Please note tattoo coverage is an additional charge, please enquire for pricing.